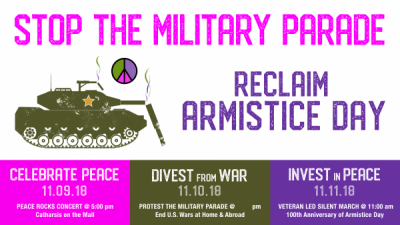 A network of 187 organizations has come together to urge a mass protest against the military parade in November called for by President Trump. The military parade is widely opposed. Army Times conducted a poll of its readers; 51,000 responded and 89 percent said, “No, It’s a waste of money and troops are too busy.” A Quinnipiac University poll found 61 percent of voters disapprove of the military parade, while only 26 percent support the idea. The national consensus is there should not be a military parade. Featured image is from Diane Dutra.